How to get a prescription for Depo-Testosterone online. Why must a patient be over 30 in order to get a depo-testosterone prescription? Experts say that hormones do not begin to deplete in the body (for both males and females) until about the age of 30. Of course all people are different and will mature and develop at different times in their lives. The chronological age of 30 is just an estimate. However, studies do show that hormones start to decrease as the body slows down sometime after the third decade of life. Testosterone is manufactured in the testicles in males and in the ovaries in women. As aging continues after 30, these organs start to slow down. Hence, the production of testosterone slows down. This is when symptoms of aging begin to happen. When ailments are due to low T, testosterone replacement therapy (TRT) can reverse them. In fact, they can make a person feel better than they did when they were in their 20’s. The reason that Greenberg Health requires each patient to get a physical examination from a qualified practitioner (along with the blood work) and why they require a medical history form to be filled out is to see that a prospective patient in good health. Yes, clients will be dealing with many ailments, but if these are due to low T because hormones are too low, TRT can make all the difference. On the other hand, if many serious physical problems are occurring that have nothing to do with hormone levels, TRT may not be a good alternative for the person. In this case, they will not qualify to get a depo-testosterone prescription online from us. It is vital for people to understand that TRT is not a weight loss program. Losing excess body fat is a great benefit that patients get from taking our prescribed injections; however, they will not be prescribed depo-testosterone just so that they can drop pounds. Increased sexual libido, loss of erectile dysfunction, longer and stronger erections and stronger orgasms are major benefits that patients receive from TRT. However, a depo-testosterone prescription for injections will never been given by Greenberg Health just for sexual enhancement. The same goes for physical enhancement of the body and better endurance, stamina and energy levels for working out. Again, these are great results that people get from depo-testosterone shots, but only via a prescription when they test to have low T.
If you want to buy depo-testosterone injections legally, you will need a prescription to get them. There is no way around that fact. If people are caught by the law using these shots without them being prescribed by a qualified doctor, they will be breaking the law and there will be consequences. Monetary fines and jail time have been given to those misusing and/or abusing depo-testosterone injections. In addition, it is not safe to buy and use depo-testosterone injections without a prescription and medical supervision. If you do not get permission from a doctor to use these kinds of medications, you will not know how much your body can safely take without negative side effects, you will not have readily available medical help available if something does not feel right and you could be buying tainted, inauthentic or completely fake injections. Risking your health by buying injections from an unknown source versus buying a depo testosterone prescription from a doctor may not pay off in the end. In fact, you could really do some serious irreversible damage to your body. Most all experts would say that it is not worth the risk. Step one: Call our clinic using our toll free number. Our clinical advisors are fully trained to talk about testosterone replacement therapy, how to get a prescription for injections, depo testosterone prescription cost and everything else about a medically supervised TRT program. They are fully capable and willing to answer all of your questions regarding treatment and to help you to decide if TRT is right for you or not. Any patient who wishes to get testosterone injections, must be tested by a qualified practitioner in order to check for low testosterone levels. This blood test is the same procedure that you would go through for routine blood work that you should get yearly. The only difference will be what is being looked at in the blood. Our licensed doctors will be able to tell if low T could be causing your problems. In addition to that, you will have to get a physical exam and share your medical history by filling out an online form from our website. Your information will always be safe and sent to us via a very secured connection. Our advisors will set this appointment up for you and you will not have to travel far. We work with clinics and labs all over the US. There will be one in your city. How do you get a diagnosis of low T? After you have completed your testing at the clinic in your city, the results will be sent back to our clinic. Our doctors will carefully analyze the results and from your blood work, they will be able to determine if you have low T or not. If you do, they can diagnose you as such. The doctors must then look at your current physical exam results and your medical history to make sure that your health is good. This will allow them to write you a depo testosterone prescription online. 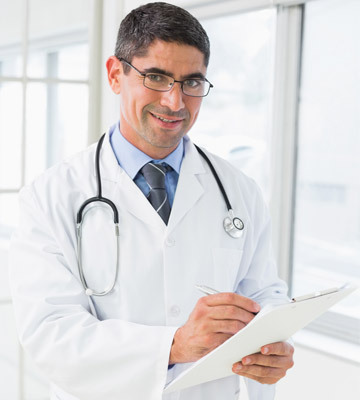 Those are the steps to getting yourself a safe and accurate depo-testosterone prescription. This means that you will get the right medication at the correct dosage for your condition, your body chemistry and your symptoms. You will also get a tailor made treatment plan created for your needs and the doctors will be providing medical supervision for your therapy throughout the time you are working with us.